I am now updating from my new home in Los Angeles. North Hollywood actually but you get the point. The move was not a fun experience but we’re here now and I wouldn’t change it for anything. Last week Tuesday marked the dvd release of Fallen Angels. It can be bought from Wal-mart, Best Buy, Amazon and many other fine retailers. The disc has a few nice featurettes including one featuring Bob Keen talking about the film’s demons. There’s plenty of nice footage of me fussing over various monsters. Dark Delicacies held a release party and signing last Wednesday. It was an all star event with Bill Moseley, Reggie Bannister, Michael Kaliski, Richard Van Vleet, Rick McCallum and others. They all talked to fans and signed dvds in this super cool store in nearby Burbank. I know it would’ve been smarter if I had posted this up before the event but Hey! Better late than never, right? 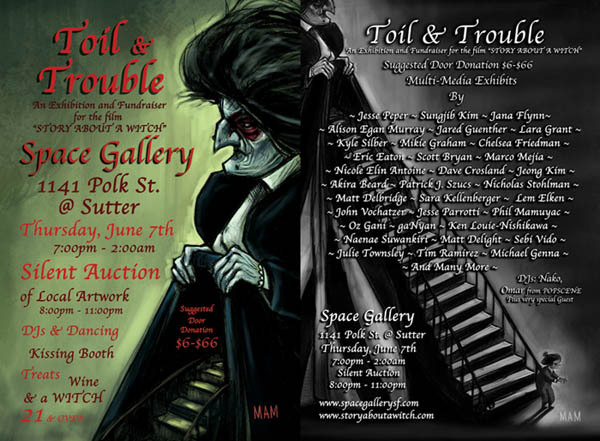 Thursday, June 7th you’ll find myself and many other fine artists at the Space Gallery on Polk St. We’ll be displaying art from “Story About a Witch” as well as many of our own unrelated pieces. I’ll be debuting some new pieces that I’ve been working very hard on. 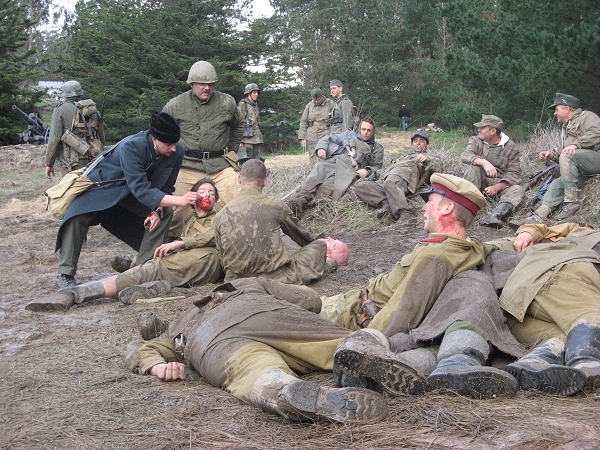 So back in December is was working on the WW2 adventure, “Brother’s War”. It was awfully cold in Rohnert park that month and I found myself raiding wardrobe as much as possible. It didn’t hurt that I love furry hats. Thanks to Anthoiny I’ve got this great picture of me “tending” to the battlefield’s wounded. I’ve got to get myself a hat like that. Just thought I’d say Hi to everyone in Alysia’s Chemistry class. I’m glad I could bridge that school/ Myspace gap for you. 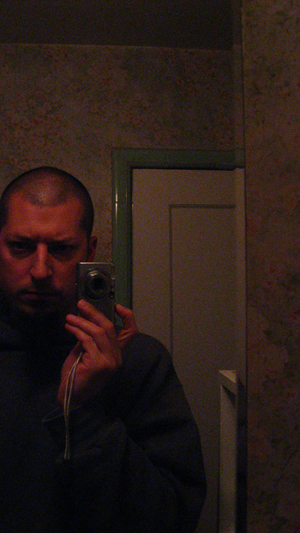 So, just for you, just because I’ve never done one before I give you the obligatory Myspace bathroom mirror picture. This weekend ( Jan 5,6,7) I’ll be in San Jose at the Fangoria Weekend of Horrors. I’ll be doing some make-up demos and shmoozing with horrors finest. If you happen to find yourself wandering around the Doubletree Inn make sure to stop by and say hello. I think I’ll be there all weekend either at the Fangoria booth or strolling around acting like a hot shot.